In The Kitchen with Policy: Truth, Love, Liberty…and Brunch + Shrimp & Grits Recipe | Exploring Food & Drink in D.C.
Shrimp & Grits - Truffled Asiago Cheese Grits, Tasso Ham, Green Onions, Diced Tomato, Triple Sec-Cream Sauce. Taking advantage of what was probably the last weekend with 80+ degree weather, we opted to sit outside on Policy’s dainty patio with our other table guests. Ordering a slew of things to get the full Policy experience. Now knowing what to order, and what to stay away from (yeah… there were unfortunately some of those dishes, but there always is), we think we’ve narrowed down the menu enough to highlight what we think are some of the best dishes and the dishes best avoided. 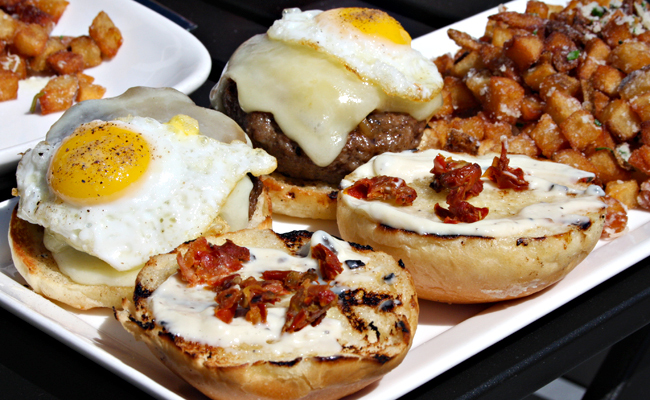 Policy’s menu is separated into “Brunch, Eggs & Such”, “Sliders”, “Seafood”, and “Sides”. Before you even decide on real food, order the Beignets (zeppoles) with Cream Anglaise sauce (and either the unlimited mimosas and bloody Mary’s for $15, or a Beer-Mosa). Fresh, warm, powdery, and ridiculously delicious. There needs to be an unlimited option for the Beignets, because yes, we can live on fried dough alone. 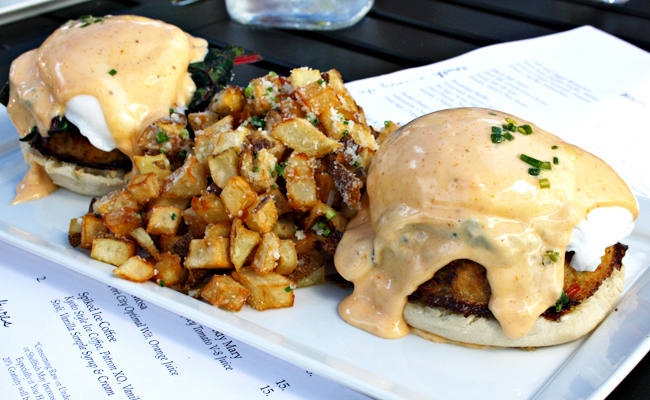 Once you’ve decided you can pull yourself away, we suggest the Crab and Eggs Benedict (Housemade English Muffin, Wilted Spinach, Crispy Parmesan Potatoes, Tomato-Old Bay Hollandaise). Crab bennies are something of a hit or miss for us. We don’t do mushy crab cakes, and we cannot stand over-poached eggs. Needless to say it has been awhile since we’ve had a good benedict so we were thrilled with Policy’s house made English muffin, and the fun flavorful take on the hollendaise sauce. The wilted spinach added an earthy flavor and leafy texture (although it needed to be washed a little more – gritty spinach… no thanks), and the crab cake was crispy on the outside, with discernible crab pieces and not just a mushy mass of crustacean on the inside. 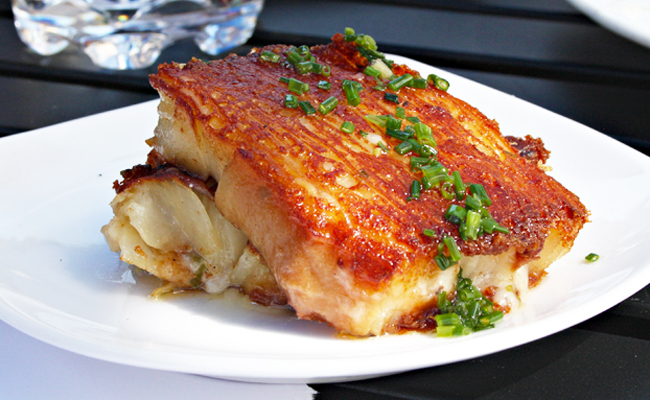 Then, combine with the parm potatoes and we’d order this every time. Take note, Policy rocks the crispy potatoes. 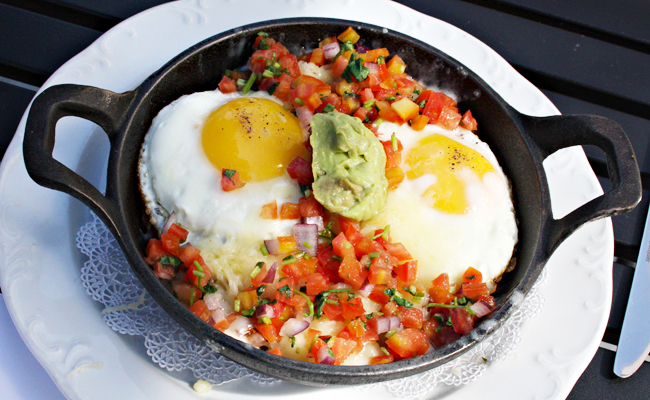 The miss for us in the “Brunch, Eggs & Such” section of the menu was the Breakfast Skillet (Housemade Mexican chorizo, two eggs sunny side up, fried potatoes, pico de gallo, avocado, cheddar cheese). Beautifully presented, it lacked seasoning beyond salt, and the dollop of guac does not equal avocado. Perhaps a few fresh slices of avocado would have upped the presentation? After all, it was ordered because of the advertised avocado. We did appreciate the sweet potato and housemade chorizo though. Moving on down the menu to the sliders, the winning orders were the Bacon, Egg & Cheese Sliders (Applewood smoked bacon, arugula cheddar, truffle mayo on brioche), and the Brisket Sliders (ground brisket, caramelized onions, fried quail egg, oven dried tomato, white cheddar, black truffle mayo) – we’re seeing a truffle theme at Policy. Both dishes of sliders were devoured in seconds. 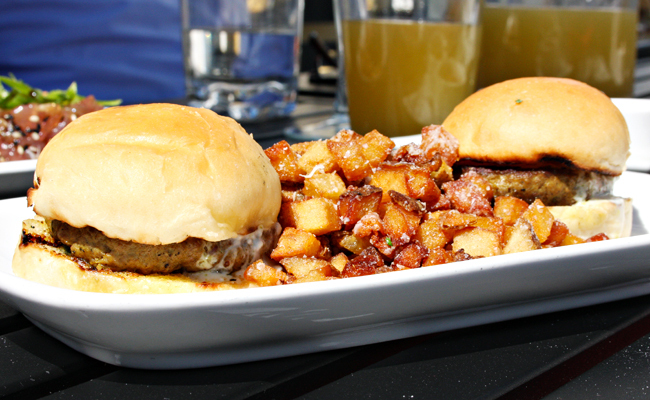 However, we’d suggest staying away from the Madras Curry Lamb Sliders (Gorgonzola, mint pesto). Don’t get us wrong, we love lamb and curry, but the consensus of the table was, “It tastes like a veggie burger in disguise.” Overly curried to the point that the texture of the seasoning came through more so than the lamb, we took a bite and left the rest to the birds. Figuratively of course. 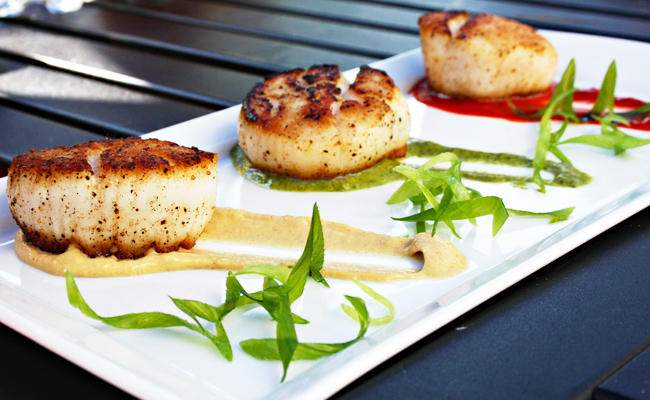 We found the Pan Seared Scallops (green sauce, spicy mustard & dried chili sauce) a little confusing. The scallops were cooked well and the dish was beautiful, but the sauces left us wondering what was the point of their existence. The spicy mustard was beyond over powering, and the dried chili sauce tasted like nothing when we were expecting some sort of kick. Not even sure what the “green sauce” was, it happened to be the most complimentary to the scallops in our opinion and that’s what we stuck with. Finally it was requested that we try Policy’s infamous “Hash Browns” (thinly sliced potatoes layered with Parmesan Cheese and Cream). Described as being more like a scalloped potato with a relatively intricate preparation process, we expected something entirely different than what was delivered to the table. An interesting concept for hash browns with just as interesting of a flavor, we only wish it hadn’t been so greasy, and instead more creamy. We love the location of Policy and the fun party-esque vibe. Self described as having a “menu designed with Global flavors infused into American Cuisine” “prepared with only fresh and authentic ingredients, scratch made sauces and original recipes”, and notably craft cocktails designed by one of our all time favorite mixologist JP Caceres (Founder/Principal of The Menehune Group) we will happily go back with a group of friends – perhaps this time bypassing the mimosas and going straight to the cocktails. Place a heavy sauté pan on the stove and put at a med/high flame. Get pan hot. Coat shrimp in blacking seasoning and place oil in hot pan. Add Ham and cook for 10 seconds. Add Shrimp to Pan and cook on one side 30 seconds and flip. Add triple sec and flambe. Add heavy cream and tomatoes and green onion. Place shrimp on grits. Reduce sauce till it coats a spoon. Place sauce on each shrimp and garnish with chives. Tags: 14th Street, Brunch, Lounge, Policy, U Street, washington dc. Bookmark the permalink. Wow, shrimp and grits sounds really good. What a unique recipe. The breakfast skillet and hash browns sound positively incredible. That would be what I’d order! Shrimp and grits is a recipe I’ve been dying to try! I’ve never had it before. Maybe I’ll try it. Shrimp and grits is one of my favorite meals. I order it whenever I can and I make it at home all the time! I’ve never been a big grits fan but I love shrimp so much, this recipe might be a game-changer! The pan seared scallops look amazing! I’m not sure how I feel about the shrimp and grits but I’m willing to give the recipe a try! This place sounds just like a spot the hubby and I would frequent. 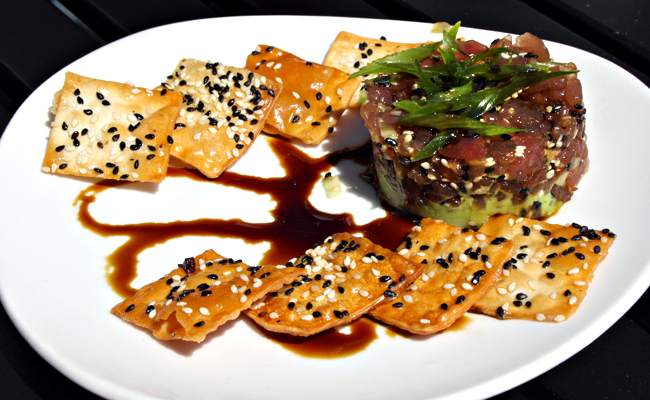 And the tuna tartar looks amazing! That recipe looks amazing. I have never had grits before! 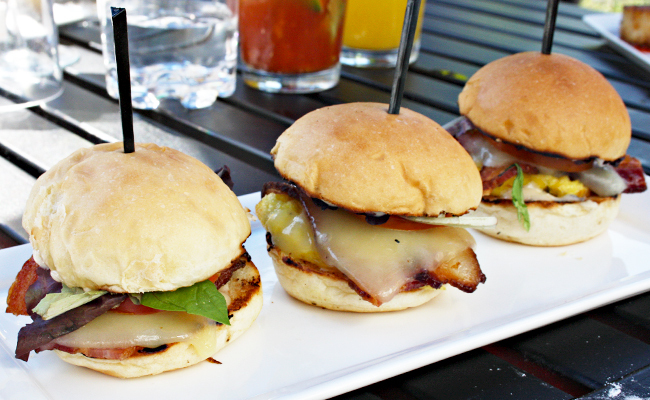 You won my heart at bacon egg cheese sliders with applewood bacon?! Completely drooling right now. I love shrimp, and seafood in general, but I’ve never had grits either. I’d love to try them though. Hubby would thoroughly enjoy this. He’s a lover of everything here. I would love to try that curry lamb sliders. Thanks for the recipe. I’m going to have to try that recipe! Man does that all sound amazing! You had me at shrimp and grits! It’s definitely one of my favorite comfort foods! 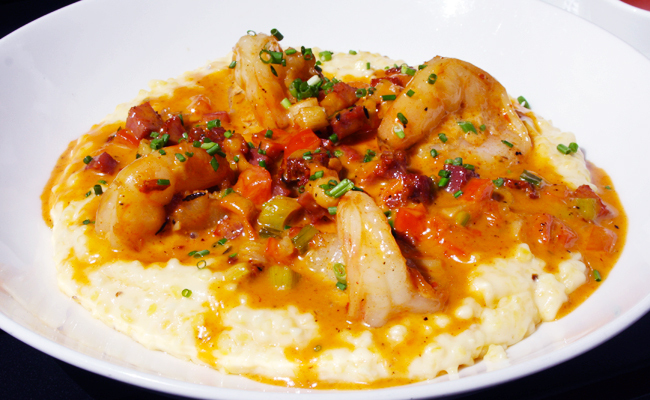 Shrimp and grits – now that is a Southern meal! I’ve never tried making my own grits! We New Englanders are so whimpy with our grits! Looks good!